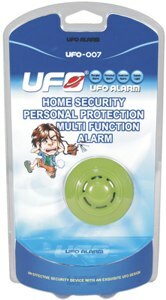 Carry the UFO Alarm as a Burglar, Door Window, Drawer, Personal or Handbag Alarm. Also contains a Flashlight that projects from the bottom of the alarm! When in threat, press the panic button and the high pitched alarm siren will effectively scare off the assailant. If your bag is snatched, the attached alarm will be instantly activated, to avert a dangerous situation and avoid possible financial loss. Easily setup indoors on doors, offering a sense of security when staying away overnight or living alone. - Burglar alarm: patented and innovative design allows the alarm to be armed from the outside using the alligator clip and rubber shim. - Door/Window alarm: use the alligator clip to secure your doors and windows. - Drawer/Cupboard alarm: use the alligator clip to protect your private documents and valuables. - Personal alarm: if you?re threatened, press the panic button or pull the wrist strap to activate alarm. - Bag alarm: if your bag or purse is snatched, the alarm will sound.